National obesity figures are at an all-time high — and growing. Weight is no longer just a personal problem, it’s a national problem requiring immediate attention. In California alone, obesity is costing the state $22 billion per year.1 That’s in California — a state we all imagine being populated with the healthiest people in the country. Weight is threatening our future. Recent reports indicate that within the next 10 years, obesity threatens to cut up to five years off the average U.S. life expectancy.2 And, for the first time in history, children may not live as long as their parents.3 The financial loss can be measured in dollars. The loss in life expectancy can be measured in years. But the loss in quality of life is immeasurable. Weight is a “tip of the iceberg” symptom of both mental and physical health — and also energetic health. Being overweight, or underweight, is not one problem. It is the result of a series of factors. Once we see weight in the context of the bigger picture — as the result of behavior patterns such as excess consumption, loss of control, and disrupted energy — we can find ways to track the components amenable to change and healing. Let’s explore some of the ways in which the aura, or energy field, can be realigned in order to yield both precursors to weight loss, as well as actual weight loss. 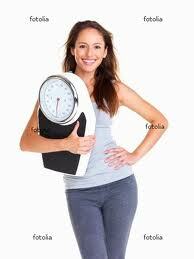 Our weight is the result of a complex interaction of factors, ranging from genetics to stress. 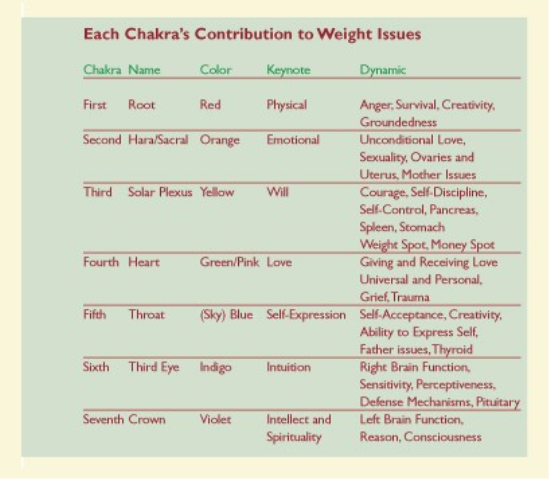 By categorizing the factors that affect weight, diet, and exercise into physical, psychological, and lifestyle areas, it becomes possible to work on the myriad of issues affecting weight through energetic realignment. The physical factors affecting weight include genetics, metabolism, hormones, and thyroid function. Our constitution, gender, and age determine our metabolic rate. Constitution can be defined as the natural functional tendency of the sum of your genetic makeup when left undisturbed. Genetics determines your body type (ie., ectomorph, mesomorph, or endomorph), and body type, like height, needs to be taken into account in assessing ideal weight, as well as weight gain tendencies. With regard to gender, men tend to metabolize faster than women. As we age, our metabolism slows. It’s inevitable we will begin to gain weight, unless we cut down on caloric intake or increase our frequency and duration of exercise. The effects of perimenopausal and menopausal changes in women, and the tendency to gain weight during midlife, are also well recognized. While the physical facts of constitution, gender, and age can yield an ideal weight chart, actual weight will be influenced by personal psychology. 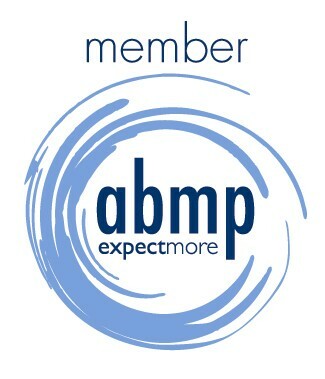 Behavioral issues around gaining or losing weight need to be distinguished from eating disorders that can be classified as diagnosable illnesses, such as anorexia nervosa, bulimia, and depression. Such illnesses can be life-threatening and are best treated under the supervision of professionals qualified in psychiatry and psychology. The touchstone for assessing “diagnosable illness” versus “behavioral issue” is the relationship to reality. For example, an anorexic believes herself to be fat, even when the scales show otherwise. Psychological factors affecting weight include personality traits and behavior patterns, or unconscious and conscious learning. Weight gain and weight loss are influenced by constructs such as self-image (the way the client values and respects herself in general) and body image (the way the client perceives her body). Personality traits such as self-discipline (the ability to get yourself to do something) and self-control (the ability to stop yourself from doing something undesirable) play a huge role in weight-related behaviors. The visible behaviors are driven by unconscious material. For example, unresolved issues regarding authority figures (parents, teachers, bosses) trigger challenges with self-discipline and self-control, showing up as over-indulgence patterns that cause weight gain. Emotional states, such as anxiety, can lead to weight gain because food is commonly used as a tranquilizer. Emotional states can also lead to weight loss in an attempt to exercise rigid control over the environment via stringent dieting. Weight gain and weight loss can also be triggered by traumatic experiences — either sustained trauma (an abusive relationship) or sudden trauma (an accident, divorce, or bereavement). Excess stress is a major cause of disease and weight problems in our Western lifestyle. Prolonged stress overstimulates the adrenals, leading to a cascade of hormone disruption. Elevated stress hormones interfere with progesterone and estrogen levels, diminish thyroid function, and disrupt sugar metabolism, leading to insulin resistance. A client who complains she cannot lose weight, despite dieting, should be taken seriously. Inability to lose weight is a major symptom of insulin resistance and could well be an indicator of hormone imbalance induced by adrenal fatigue. Insulin resistance is a precursor to diabetes and heart disease. Unfortunately, because of our demanding lifestyles, many people are caught in a downward spiral of poor diet, exercise, work, and sleep habits, which leads to more stress and decreased health. It is imperative to take action that can break the cycle and reverse the spiral toward health and well-being. In weight management, people usually cause themselves even more stress by attempting to impose on themselves changes in diet and exercise. Since psychological factors generate patterns of behavior like excess consumption, loss of control, and self-medication, lasting change needs to address the underlying “why” of these behavior patterns. Unless there is treatable pathology or imbalance, predisposing physical factors are unchangeable. When it comes to the psychological factors, history cannot be changed, but interpretations, attitudes, and reactions to past experiences can be. Realignment of the aura offers a powerful way to directly alter interpretations, attitudes, and reactions. For example, if the client enters the session stressed, her tension will generate great concern about the time. As the tension dissipates, her attitude toward time will gain a more relaxed perspective. Changes in the energy field generate changes in perspective and paradigm and consequently changes in experience. By working directly on the energy field, it is possible to reprogram the physical, psychological, and lifestyle patterns affecting the system. We are becoming more and more familiar with the concept of the human energy field or aura — the part of us that extends beyond the physical body. Thanks to the respected work of Barbara Brennan, Rosalyn Bruyere, and the Healing Touch Movement, energy work is becoming more extensively recognized in the medical environment. The aura emanates from the physical body and forms an electromagnetic energy field around the physical body. Chakras give access to the energy field. In the Vedic system, the oldest written tradition in India, there are seven major chakras. They are given names and an associated color of the rainbow: the root chakra (red), the hara or sacral chakra (orange), the solar plexus chakra (yellow), the heart chakra (green and also pink), the throat chakra (sky blue), the third eye chakra (indigo), and the crown chakra (violet). Each chakra gives rise to a layer in the aura, the first layer being the physical body. Altogether there are seven layers. In a balanced system, the chakras and aura layers work harmoniously together forming an invisible field of white light that surrounds and permeates the physical body, maintaining energetic health and well-being. Under stress, the chakras spin unevenly and layers of the aura can separate, pull away from each other, form bubbles, or, through extreme trauma or substance abuse, even form leaks. The chakras and the layers of the aura form a grid, with areas corresponding to points in the physical body. By scanning this grid, one can locate points or spots in the aura requiring adjustment, beginning by checking a “suspect” chakra at each layer of the aura. Only a small proportion of people can see the energy field in a way that offers accurate information. A much larger proportion are guided by what they feel. You could sense a zing, a ping, a buzz, a gap or hole, a breeze, a falling sensation, a temperature change, or simply a “click” in your mind. If you’re an empathic healer, you may have to process information as a personal experience, even though it should be experienced as outside stimuli. If you’re clairsentient, you will be guided by “just knowing,” rather than by seeing or feeling energy. In the end, each practitioner will develop a personal style for detecting irregularities in the energy field and learning how to interpret the information. Trust your nervous system to clue you in. Watch your client for physiological signs that show you’re having an effect — this is your most reliable indicator. Some of these signs include changes in breathing, changes in facial coloring (pinking up indicates increased energy flow, becoming paler indicates deep relaxation), rapid eye movements under closed lids and with eyes open, blinking, twitching, and jerking. Before using new techniques on a client, it is advisable to practice on a colleague or friend, especially if you know someone who can feel energy and can give reliable feedback. Train yourself by translating what you sense or feel into words. This will help you build a vocabulary that gives you access to energy information. Gallery | This entry was posted in Energy Healing, Energy Medicine, Holistic Healing, Integrative Shiatsu, Massage, Our Center, Reiki and tagged Diet (nutrition), Health, medical, Physical exercise, United States, Weight gain, weight loss. Bookmark the permalink.